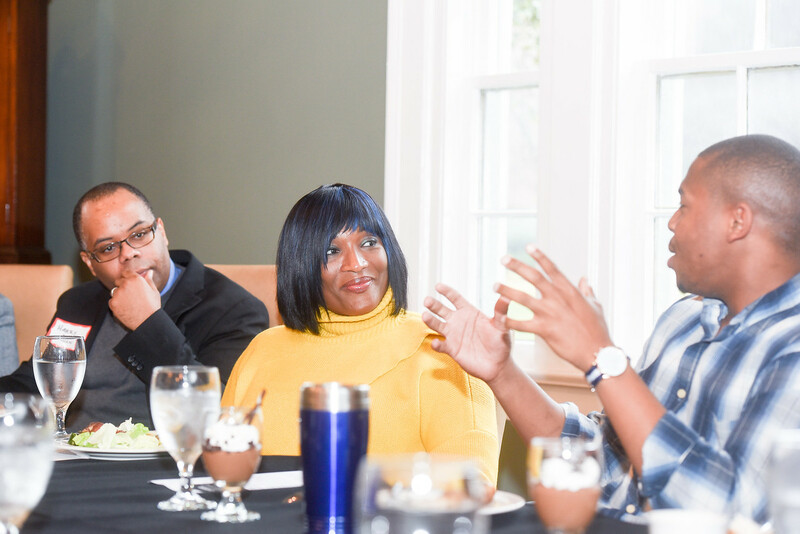 In a new edition of the “Career Conversations: Bruin to Bruin” series being sponsored by Alumni Relations and Career and Professional Development, 2004 Belmont alumna Taj George returned to campus Wednesday to offer advice and insight to a group of students and alumni. Born and raised in New York, George’s career path took numerous twists and turns, all of which she embraced with the unbridled energy she still possesses. One-third of the multi-platinum singing R&B group Sisters With Voices (SWV), George has found tremendous success in the music business and has toured the world. In addition to being a wife and mom, she also has modeled through the years, starred in a reality TV show with her husband–former Tennessee Titan Eddie George–and authored two books. But it was a surprising role that challenged her the most and still brings her a great sense of pride: her participation in the 2009 season of Survivor. The “Career Conversations: Bruin to Bruin” series began in Fall 2016 as a joint endeavor from the Office of Alumni Relations and the Office of Career and Professional Development. The program aims to gather alumni and current students for an intimate conversation about career life. Although alumni often speak on campus at convocations and large lectures, there was no existing program that allowed conversation to take place in a small and interactive setting. The sponsoring offices hope this new program will provide a more engaging opportunity for alumni to share their experiences with students who are studying their industries.